DISCLAIMER: I am not a doctor. This web page does not constitute medical advice. If you feel you have a medical problem, please see a doctor. Who: Me, Vinny, a healthy 25-year-old at the time. What: I survived a posterolateral dislocation of my left knee, and resulting foot drop. Where: Somewhere in the middle of the "Skull" and "Toadstool" rapids on the Cherry Creek/Upper Tuolomne river outside of Groveland, CA. When: Around 10 AM on Saturday, July 10, 2004. Mark and I arranged a whitewater rafting trip as part of the celebrations for Keith's bachelor party. On July 10, 2004, twelve of us guys met our 3 guides in Groveland. We drove out to the drop off point at the power station on Cherry Creek and piled into 3 rafts, four guys and one guide per raft. After the necessary training and safety exercises, we pushed off. Going over the "cattle chute", my left foot came loose from where it was wedged into the side of the raft. My balance thus lost, I fell over the side of the boat onto my back into the water, and my little swim began. I got swirled around a bit (at what must have been the bottom of the cattle chute), and popped up for some air. I didn't feel too bad yet, perhaps a bit panicked. Maybe two seconds later, the rapids pulled me back in and my swim continued. I really don't know how long these little swims lasted - the whole episode was probably only 30 seconds. This time around, the water was very turbulent, and I had no control over my body. I remember my back getting slammed against a rock (ouch), and my subsequent realisation that I was on a dangerous swim. Some time later, my head surfaced. I had enough time for one deep breath of watery air, and I managed to hear people yelling and see a flash of a yellow raft before getting sucked back under. This last portion of my swim was the longest. I tried to put myself feet-first and onto my back, but the currents were too strong to manoever. I was essentially a rag doll in these rapids. During these struggles, my right shoulder dislocated. I focused on staying calm and holding my breath. Some seconds later, I felt a sudden extreme jolt of pain run through my left leg. The only thing I remember thinking while in the water at this point was that I felt I could get out of the river, just as long as I didn't injure another major body part. Then, I popped out in the eddies at the bottom of the rapids. Some say I swam, but mostly I floated towards my raft where I grabbed Kevin's hand with my left arm. Aaaahhhhh. Kevin tried to pull me into the raft, but I resisted, being too exhausted and too afraid of falling out of the boat again. At the forceful and colorful urging of the raft's guide, Kevin yanked me into the raft. I fell on top of Kevin and pinned him to the bottom and spat up some water. I laid there in shock for a while. My memory is especially vague here. Mark's raft came over, people were hovering around me. I looked at my leg but couldn't see anything wrong with it. I couldn't move my left foot. At the time I assumed I had basically ruptured everything bone/muscle in my ankle. I eventually communicated that my ankle and knee were severely hurt, and that I had dislocated my shoulder. Mark tried to reduce the shoulder injury and succeeded on the second try. Then there was a lot of talking amongst guides and moving me around. I ended up on the rocks on the right bank of the river. Some kayakers floated by, and we entreated them to hurry to the bottom of the river to call for the rescue helicopter. It was too dangerous to raft me down the river (especially since there were several portages where I'd have to walk), I was unable to walk up the canyon to escape myself, so a helicopter it would have to be. Kevin stayed with me while the rest of the rafts continued down the river. Waiting for the helicopter was terrible. And very hot. Several hours later, it came and they lowered a sled and an EMT on a rope. After establishing I had a leg and shoulder problem (apparently the kayakers had alerted the search and rescue team that I had a neck/back injury), Kevin and Scott the EMT tied me into the sled (update: Barbara informs me that these sleds are called litters; possibly even a Stoke's litter if I remember what the sled was made of). The EMT stepped aboard, told Kevin he'd have to climb out of the canyon on his own, and we took off. At the top of the canyon we put down the helicopter, put me in the helicopter, and flew to the Columbia airport. At the airport, they put me in an ambulance where I headed off to the Sonora Regional emergency room. In the ambulance they gave me some morphine, my first painkillers. This made me feel much better. Not much happened at the hospital. They took x-rays and determined that I had broken no bones or ruptured arteries. I was lucky in this respect - I could have easily ruptured the femoral or popliteal artery with my severe kind of injury. In the 6 hours it took to get me to a hospital, I would have lost my leg. They discharged me when my friends came to see how I was. I think I was also prescribed some Vicodin. Chris drove me home in the backseat of the car that night. The next day Mark took me to the urgent care facility at my health plan's (Kaiser) local hospital. They didn't trust the results of the x-rays from Sonora Regional, so I took x-rays all over again (and made the same conclusions). The urgent care staff determined that the orthopedic specialist on call did not need to see me. I was scheduled to see the orthopedics department the next day. Here's a funny voicemail of our first qualified diagnosis. Over the following 5 weeks I saw a bunch of doctors, intending to get the correct diagnosis and treatment. Orthopedists have two main tools to diagnosis knee problems - clinical exams and MRIs. In the clinical exam, the doctor will essentially bend your knee in 4 directions that it isn't supposed to go. These 4 directions are usually prevented by the 4 main ligaments in your knee: the MCL (medial collateral ligament), LCL (lateral collateral ligament), PCL (posterior cruciate ligament), and ACL (anterior cruciate ligament). Depending on how loose certain motions are compared to a strong knee, the doctor can get an idea of which ligaments are damaged. These bendings can be painful. MRIs essentially take 2-dimensional black-and-white density scans of your knee. The ones I had were taken every 2 mm in all three planes (xy, xz, yz). The doctors/radiologists should be able to identify not only ligament damage, but signs of bone damage, meniscus and cartilage damage, and edema. The "final" diagnosis on my orthopedic problem was that I suffered a posterolateral dislocation of the knee (my knee blew out to the rear and outside). My LCL, PCL, and posterolateral capsule (a collection of minor ligaments on the back-left side of the knee) were torn, and my ACL was partially torn, possibly completely torn. The debate on the ACL was due to the imperfect nature of the MRI (only scanning every 2 mm). Side view of my ACL, looking at the outside of my left knee. Notice the slight sag in the ACL between the two connection points. The ACL (and all ligaments, really) should appear narrower and straighter. Two views of my PCL (using the same point-of-view as the ACL image, but 4mm and 6mm away). It is easily apparent in these images that the PCL is torn in the middle. View of the lateral side of my left knee. You can compare the difference between my MCL (the thin black band on the inside of my left knee (the left side of the image)) and the lack of my LCL. Swelling is apparent. But, the dislocation also caused a neurological problem. Diagnosis was generally easier because of more obvious external symptoms, but harder to obtain because very few people specialize in this kind of injury. Again, there are two tools to diagnose this neurological problem, clinical exams and the electrical tests called electromyograms (EMGs) and nerve conduction studies (NCSs, often called nerve conduction velocity test). Clinically, the doctor can get an idea of which nerves in your leg are not working by figuring out which directions you are unable to move your leg (or foot or any body part for that matter), or in which directions of motion of you have decreased strength. The doctor can also tell by where you have lost sensation which nerves may have been damaged. Tinel's sign is another clinical tool used to determine where nerve regeneration and growth is taking place. If a nerve is growing (healing), it will tingle if tapped. Doctors usually then tap with their finger along the length of the peroneal nerve, asking you to identify where tingling starts and ends. If the location of Tinel's sign moves down the peroneal nerve over the course of a few weeks, then the nerve is growing and regenerating. If Tinel's sign is not moving, no nerve regeneration has taken place. An EMG is used to measure the conductivity of a nerve. A voltage potential is 'sparked' into your leg close to a relevant nerve (like the sciatic or peroneal) and electrodes at the other end of your leg measure the response of the muscles (as a result of extracellular field potentials). A nerve conduction velocity test is usually performed at the same time as an EMG to differentiate between nerve and muscle damage. In the NCS, the nerve is precisely stimulated with an electrode (in this case, a small needle inserted as close to the nerve as possible) and the same electrodes from the EMG can record the result. Simple distance/time calculations will yield nerve velocity data. Neither of these exams are useful until 6 weeks after a traumatic injury to the nerve, since it takes 6 weeks for a nerve to fully 'dennervate'. These tests also will not tell you instantaneously if the nerve is healing; neurologists tended to recommend waiting 3-6 weeks between tests to look for change in results. I had EMG/NCSs performed at 3 weeks, 9 1/2 weeks, and 15 weeks; clinical exams were performed throughout by a variety of doctors. The EMG/NCS at 3 weeks was inconclusive (performed too soon). The EMG/NCS at 9 1/2 weeks showed no conduction through the peroneal nerve at the knee, and the EMG/NCS at 15 weeks showed the same result. My knee dislocation left me with one injury and two different problems: the mechanical orthopedic knee problems and the electrical nerve problem. The drop foot is the larger, more life-affecting problem, but in the short term is not as critical as the mechanical problem. Knee ligaments when torn will heal themselves and you will be able to walk again. However, the scar tissue that forms when your ligaments "heal" is not as strong and as a result, your knee will not be as strong and stable. Quantifying the loss of knee stability is a difficult thing to do (and doctors are very reluctant to even try), but I get the idea your knee gets to be around 50% as stable as it used to be. In order to maximize the long-term stability of your knee, surgery is required to repair or replace the ligaments. Timing of this surgery relative to the injury is also important: within 4-6 weeks it is possible to use the existing primary body parts to perform necessary repairs, but after 4-6 weeks too much healing has occurred to use the primary body parts. 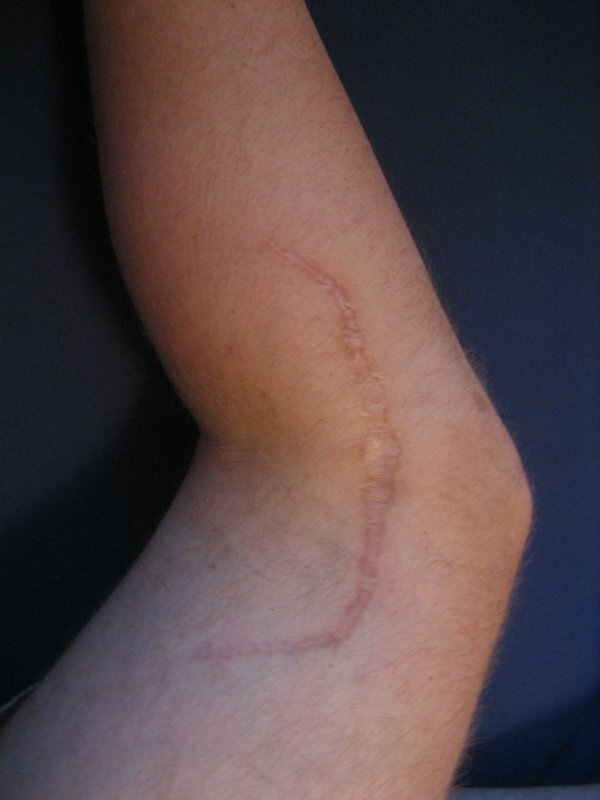 Surgical repair using the original parts is stronger than with an auto- or allograft. The trade-off is uncertainty (of what the internal damage actually looks like or if it is repairable with primary parts), and added instability and pain (on top of what you still feel from the injury). Again, it is difficult to quantify what "stronger" means, but I get the idea it's about 10%. If one is to wait until after the 4-6 week point, then he/she may as well wait a few months to regain strength and flexibility with therapy. I decided to undergo surgery in week 5. First, my knee was arthroscopically examined (through two holes) and patellofemoral compartment chondroplasty (shaving off of scar tissue underneath my kneecap) performed. My ACL was observed to have a <50% grade 2 tear. The surgeon deemed this ACL functional (at least, more functional than if he performed surgery on it), and left it alone. My PCL was replaced, also arthroscopically (but through two new holes); this was performed with a drill, a couple of bioabsorbable nails, a bioabsorbable nailgun, and a chunk of a cadaver's Achilles tendon. Then, the outside of my knee was opened up with one long (8"ish) incision. There they found that not only my LCL but also my biceps femoris tendon had avulsed off the fibular head and was repairable without any allografts. The surgeon nailed these back down to the fibula. He did a visual examination of the exposed section of the peroneal nerve and placed sutures around the nerve where he saw it was damaged. I think the procedure took about two hours. I went home after 6 hours in the recovery room. Treating the foot drop is a rarer and more complicated problem. Once EMG tests show that no nerve regeneration is occurring, a nerve graft surgery is the usual next step. There are not many surgeons that specialize in nerve grafting, particularly in the lower extremities. In this surgery, the peroneal nerve is exposed and nerve conduction tests are performed directly on the nerve (with specialized, sterilized equipment) to precisely identify the bad portion(s) of the nerve. The bad section of the nerve is then dissected and removed. These intraoperative nerve tests measure the nerve action potentials (NAPs, the strength of the electrical signal running down your nerve) of the damaged nerve. It is a relatively new technique in evaluating nerves, but it is the standard of care. Insist on intraoperative NAP measurements; numbers have shown that almost 1/4 of all peroneal lesion nerve grafts are avoided because the NAPs are still present (they are a much better indicator than the supercutaneous EMGs/NCSs). Another nerve, usually the sural nerve, is harvested from one of your legs. 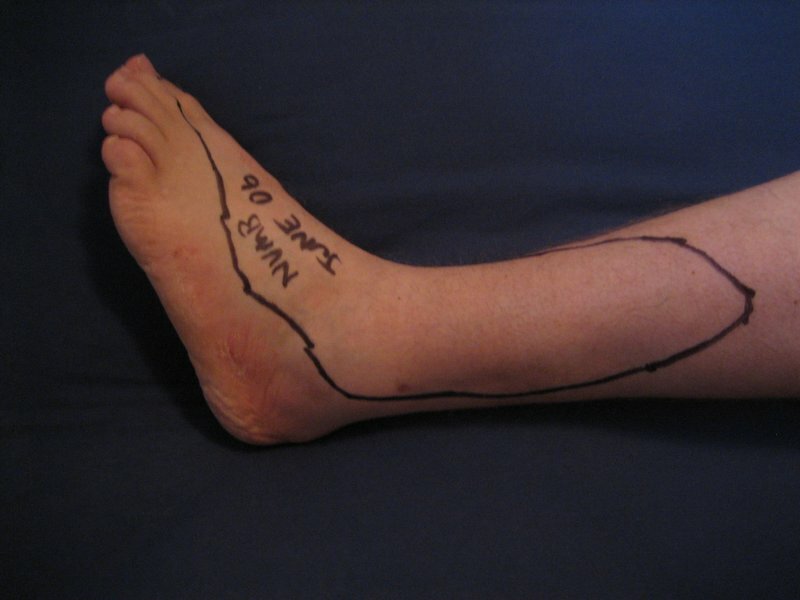 The sural nerve is cut into lengths that are microscopically sutured into the gap in the peroneal nerve. Multiple lengths are needed because the peroneal nerve is thicker than the sural nerve; my surgery required 4 'cable' grafts. These grafts do not provide instantaneous connection of the nerve. Instead, they act as scaffolding for the nerve to grow through. The rate of peripheral nerve growth is universally given as either 1mm/day or 1 inch/month. Here are "before surgery" and "after surgery" pictures from my surgery of the grafted peroneal nerve. It is interesting (for me, at least), that the damage in the "before" picture is not apparent until you see what it should look like in the "after" picture. Timing of this surgery is also important. It should not be performed too soon (<~3 months), or the surgery may be still be unwarranted. It should not be performed too late (>~6 months), or the motor end-plates (connections between nerve and muscles) die from disuse. Mine was performed in week 15. For this reason, it is best to have a peripheral neurosurgeon present with diagnostic tools at the time of your first -- the orthopedic -- surgery. If the neurosurgeon can tell immediately that you will need a graft done (I think sometimes they can tell just by looking at your nerve that it won't regenerate, without having to wait 6 weeks to check for progress), s/he can do it right away and you won't have to wait several weeks for the first surgery to heal. For 2 weeks after the nerve graft surgery, the graft should be protected by not stretching the nerve when bending the knee. I was in a straight-leg cast for 2 weeks following the surgery. This 2-week time may seem arbitrary, but my surgeon said it was derived based on studies of wound-healing and nerve tensile strengths. After both the injuries and the surgeries, lots of physical therapy needs to happen to regain strength and to get even stronger in places to compensate for permanent ligament weakness. Lots and lots of it. The graft itself may or may not work. 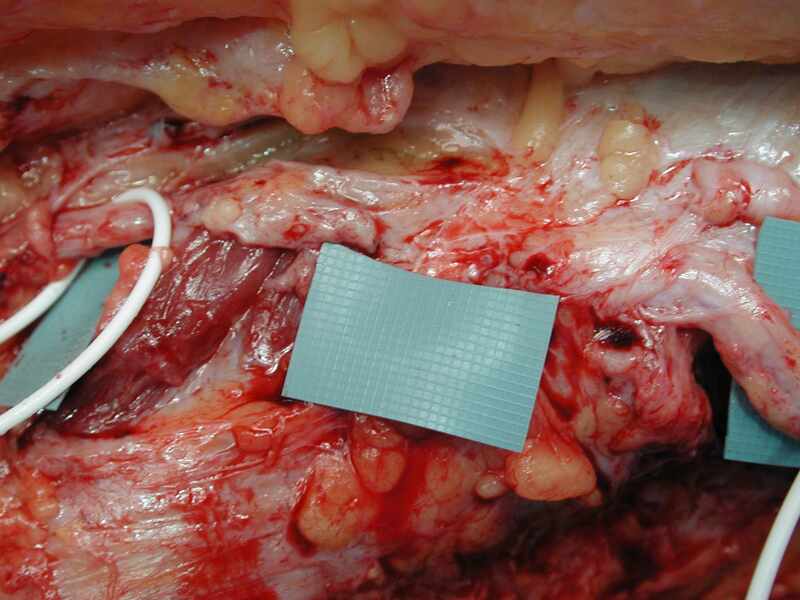 The success rate depends on the quality of the two sutured connections, the amount of nerve fibers that succeed in bridging the suture gaps, and the relative surface areas of the two interfaces. Again, doctors tend to give the nerve a growth rate of 1 inch/month, but will wait up to 2 years before finally giving up on the graft. 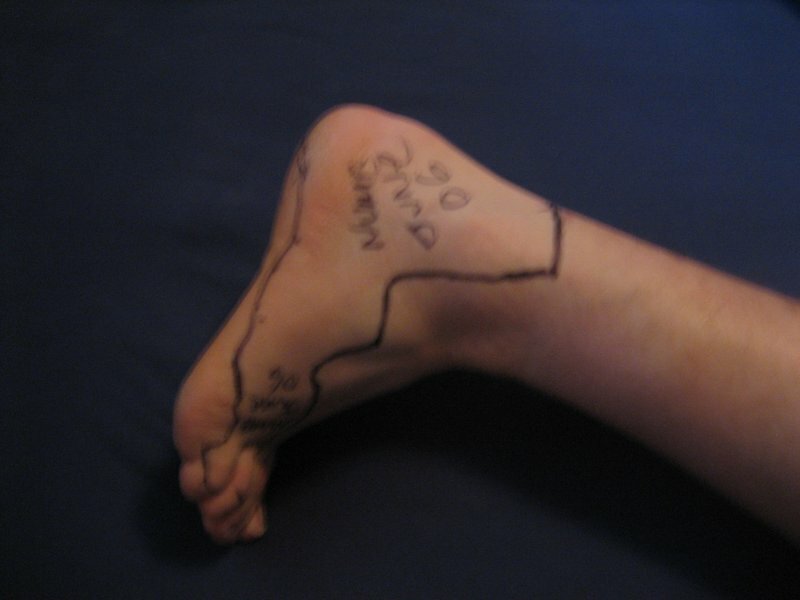 Tinel's sign can also be used to "track" the progress of a nerve graft. Nerve grafting is only 35 years old. There is a much newer method of treatment called a nerve transfer. This involves finding a useful motor nerve physically close to the damaged nerve. Half the connections between the good motor nerve and its muscle are broken, as close to the motor end-plates as possible. Half of the good nerve is then moved, rewired, into the motor end plates of the damaged nerve. This procedure is becoming more common and is quite successful in arms, where there are nerves "to spare". Around the knee, however, the only option to transfer to the peroneal nerve is the tibial nerve (the other branch of the sciatic). This is technically difficult and is not as often performed. Also, my tibial nerve was thought to be slightly damaged as part of the accident, so I was not a candidate for the nerve transfer. Dr. Mackinnon is an authority on nerve transfers. There is nothing that doctors recommend to help promote nerve regeneration. Floating around on newsgroups are things like TENs units and vitamin B-12 and laser therapy, but I've heard these all called "voo-doo" tactics by several doctors. This is all the more reason to take an interest in current research and funding. All those things you hear in the news like stem-cell research and rats who regain their spinal cells are related (or will be related) to your peripheral nerves regrowing. This is not an exhaustive list by any means. I lived in San Jose, California, so most of these people are local to the south/peninsula end of the bay area. Knee injuries are common, so finding an orthopedic surgeon is not very difficult. Posterolateral dislocations are not very common knee injuries, and I think it is rare to find a surgeon who has repaired more than 25 such injuries. If you're in Kaiser, your best options are limited. I believe that the surgeons who excel at and earnestly want to work on traumatic sports orthopedic injuries end up at sports and orthopedic clinics, not at Kaiser. I was with Kaiser for a while after the injury, so I got a good taste of what they offered. Another interesting thing to note about the sports clinics and their surgeons is that their famous patients send them autographed pictures which are hung on the walls. Often it's like walking into a sports bar. Dr. Warren King: Oakland Raiders team orthopaedist (and many other teams), my orthopedic surgeon. Splits office time between the Palo Alto Medical Foundation offices in Palo Alto and his clinic in Sunnyvale. SOAR Medical clinic: Apparently the place to go in the bay area for orthopedic injuries. I still can't figure out why they refused to see me, but don't let that stop you. The knee specialists here are Dr. Dillingham, Dr. Thabit, Dr. Wall, and Dr. Fanton. Dr. Dillingham seems to be the top dog (and 49ers surgeon). Dr. John Belzer: Works at the California Pacific Orthopaedics & Sports Medicine clinic in SF. Has periodic office hours in Greenbrae. He's the Warriors' surgeon. I consulted with him. Dr. Dilworth Cannon: He is at UCSF and came recommended from several people, but I never saw him. The 3 best orthopaedic knee surgeons for posterolateral dislocations close to San Jose were Dr. Bradford Kraetzer in Union City/Hayward, Dr. Faryniarz in Santa Clara, and Dr. David Bradley in Redwood City. Finding qualified surgeons for the peroneal nerve graft is tricky. There is no "accredited" or recognized major field of medicine as peripheral nerve grafting. The options typically tend to two camps: neurosurgeons who ended up specializing in peripheral nerves (as opposed to the brain or spine), and hand surgeons who deal with the lower extremeties because no one else will. This sounds dismal at first, but there are qualified people out there. The grandfather of peripheral nerve surgery is the neurologist Dr. David Kline at LSU in New Orleans. I heard that he may be retiring this year (2004). Several of his students have spread across the country with their combined experience. Here's a list of various doctors I either met or came across in my research for the nerve graft, in no particular order. The biggest names in the field are Dr. Kline, Dr. Kim, Dr. Mackinnon, and Dr. Dellon. Dr. Daniel Kim: Dr. Kim is probably foremost among Kline's students. He practices at Stanford. I consulted with him. 650-723-7093. Dr. Susan Mackinnon: Dr. Mackinnon is at the Washington University in St. Louis. She studied under Dr. Hudson, a close friend and colleague of Kline. I consulted with her. 314-362-4587. Dr. Rudolf Buntic: One of the surgeons at the Buncke Clinic, a hand/microvascular/plastic/reconstructive surgery clinic in San Francisco. I consulted with him. 415-565-6136. Dr. Vincent Hentz: A hand/reconstructive surgeon at Stanford. He performed my peroneal nerve graft operation. 650-723-5256. It is interesting to note the two different worlds between reconstructive surgeons and neurosurgeons: though both at Stanford, Kim didn't know Hentz and Hentz was only vaguely aware of Kim. Dr. Leonard Gordon: At the Hand and Microsurgery Medical Group in San Francisco, also with the California Pacific Medical Center, and also has his own clinic called The Gordon Hand clinic. I did not consult with him. 415-923-0992. Dr. Eric Zager: Is a neurosurgeon specializing in peripheral nerve surgery at the UPenn hospitals in Philadelphia. He advertised 20-30 peroneal nerve grafts (quite a few, relatively speaking), and studied with Kline and possibly Hentz and Kim when he attended Stanford. I consulted with Dr. Zager. Dr. Lee Dellon: Well-recognized neurosurgeon, co-wrote "Surgery of the Peripheral Nerve" with Dr. Mackinnon. I did not consult with Dr. Dellon. Dr. Chris Maloney: Dr. Dellon's partner (they have a clinic in Arizona and Dr. Dellon is also at the Curtis Hand Institute in Baltimore). I consulted with Dr. Maloney. Dr. Bruce Ehni: in practice in Houston at the Neurosurgical Group of Texas. I did not consult with Dr. Ehni. Dr. John Bishop: a foot and ankle specialist in Houston with the Fondren Orthopedic Group. I did not consult with Dr. Bishop. Dr. Michel Kliot: a neurosurgeon at the University of Washington in Seattle. I did not consult with him. Dr. Allen Maniker: a reconstructive surgeon in NYC. I did not consult with him. Dr. Nath: Strong web presence by this member of the Texas Nerve & Paralysis Institute in Houston. I did not consult with him. Dr. Terry Messer: Hand and upper extremity surgeon at UNC in Raleigh. I did not consult with him. Thanks Linda for this name! Dr. Allan Belzberg: Neurosurgeon at Johns Hopkins in Baltimore specializing in peripheral nerve repair. I did not consult with him. Thanks Manny for this name! Your options are very limited if you're in the bay area. Again, this kind of injury is rare, and neurosurgeons tend to focus on the brain and ignore the peripheral nerves, so these kinds of injuries get delegated to the next most reasonable people: the hand/plastic/reconstructive surgeons. Those throughout Kaiser in the bay area had very little experience with this problem and also didn't know who did have the experience. At the Santa Clara facility I was first referred to Dr. Tung Le, who said he had "one or two" peroneal nerve grafts under his belt, but seemed just a few years out of school. Dr. Le was in the orthopedic department, a hand and wrist specialist. Later I met with Dr. Ronald Milliken in Santa Clara, an experienced plastic/reconstructive surgeon. He had "a handful" of peroneal nerve grafts under his belt. He recommended I wait until Month 5 after the accident for a 2nd consultation and then possibly schedule surgery. At the Redwood City location Dr. Patricia Howson in the orthopedic department (a hand specialist) is the go-to-doctor for all of Kaiser on the peninsula for peripheral nerve injuries. Even so, she had never grafted a peroneal nerve before. In Sacramento there is a Dr. Aloysius Llaguno who is likely Kaiser Northern California's most experienced peripheral nerve grafter. He is currently in the plastic/reconstructive surgery department, and studied with Kline. There are not many resources for footdrop (but plenty for orthopedic problems), which is partially why I put this site up. Try Braintalk, a very active online forum for all things neurological. For footdrop questions, try the "Peripheral Neuropathy" forum. Kim D.H., Murovic J.A., Tiel R.L., Kline D.G. "Management and outcomes in 318 operative common peroneal nerve lesions at the Louisiana State University Health Sciences Center." Neurosurgery. June 2004, 54(6). Pages 1421-1428. Discussion pages 1428-1429. Kim D.H., Kline D.G. "Management and results of peroneal nerve lesions." Neurosurgery. August 1996, 39(2). Pages 312-319. Discussion pages 319-320. Surgery of the Peripheral Nerve, by Drs. Mackinnon and Dellon (1988). 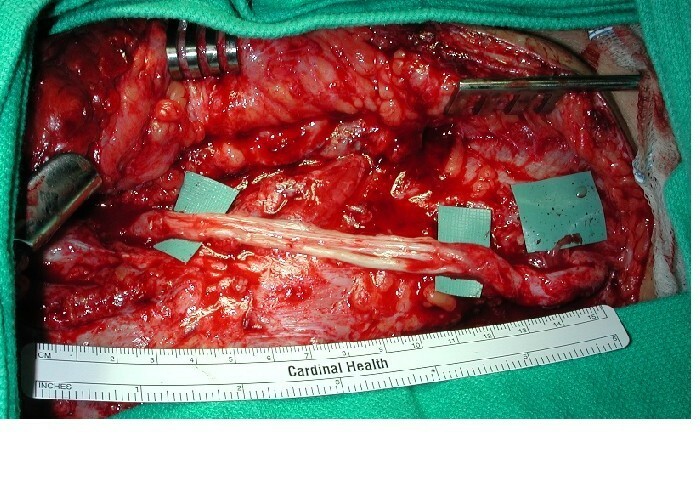 Atlas of Peripheral Nerve Surgery, by Drs. Kim and Kline (2001). Here is a comprehensive list of clinical resources for knee dislocations. Much of the information listed requires subscriptions of some sort; this is where having a doctor, med student, or librarian friend may come in handy. Some of the information there, though, like this Wheeless Orthopedic Textbook entry on traumatic knee dislocations, is free. Dr. Dellon has posted two short pdf brochures on his website, Foot Drop and the Common Peroneal Nerve and Nerve Injury and Repair. Guy was on the rafting trip and wrote about it in his weblog. NBwebexpress: An online store for New Balance shoes. If you call them up (1-800-595-9138) and ask for a "miss-mate" order, they can arrange for you to buy a pair of shoes with different sizes for left and right feet. 2009 UPDATE: New Balance has purchased the nbwebexpress.com store, and they charge a premium for mismatched sizes now. I don't buy from them anymore. Instead, I buy all my shoes through Nordstrom, which allows mismatched orders at no premium. Here are several recommendations I have for you if you suffer a major knee dislocation. Most will also apply well to other injuries. Arrange for someone to take care of you. I haven't mentioned it yet, but dislocating your knee is extremely painful. I was in 10-out-of-10 pain for two weeks, even with heavy painkillers. You'll be stuck in bed for a while. It will be 2 or 3 weeks until you can hobble around with a walker or crutches. Driving is out of the question. You will need help eating, bathing, going to see doctors, and likely even interacting with doctors. The same timeframe and needs generally apply to the knee reconstruction surgery, which is also extremely painful. The nerve graft surgery is not as painful, but is very inconveniencing. To protect the graft, my leg was placed in a cast, making everything difficult. There was serious talk in the first three days of the injury about admitting me to a hospital or a nursing care facility. My friends helped me during the first week, and after that I was extremely fortunate to have almost all of my immediate family come out to help, at various times. But, I wish you luck here: it is just as difficult to lay in bed very drugged and very pained as it is to take care of a very drugged and very pained patient, and nerves are quickly tested. Get health insurance. Hopefully you are already insured. If not, I highly recommend getting a policy, since treating this injury will cost tens of thousands of dollars otherwise. If getting a new policy, be on the lookout for pre-existing conditions. As for what type of insurance to get, that's up to you. For treating knee dislocations and sports injuries, I recommend a plan that accepts your area's most experienced orthopaedic and nerve surgeons. Get an extra set of X-ray/MRI films. The hospital or clinic where you get your MRIs done will tend to keep the films for their records. Request an extra set of the MRI films for yourself so you can show the other doctors you see, this usually costs ~$30. In fact, it is nice to prepare a packet of every relevant document that you can give to every doctor you see. Mine had operation reports, EMG reports, MRI radiologist reports, and pictures. See enough doctors until their diagnoses converge. Do you really trust the judgment of only one doctor, especially on the basis of an imperfect MRI and a very subjective clinical exam? Another good way of understanding the diagnosis, and the anatomy/biology involved, is to see multiple doctors. For the relatively small cost of an extra specialist's visit (initial consultations with orthopaedic surgeons and neurosurgeons tend to cost around $300), you might learn something drastically different and valuable. In my case, there was not much variation in the diagnosis (only in whether the ACL was fully or partially torn). See enough doctors until you understand why and how treatment methods differ. Even if all doctors agree on the problem, there will be many many ways to treat it. For my knee, the first three doctors I saw proposed three wildly different treatments: one recommended immediate knee reconstruction surgery, one recommended knee reconstruction surgery in six months, and one recommended against surgery. After seeing a few other surgeons, I began to get a larger picture of the treatment options, and why doctors tended to certain options (I feel that in the case of the knee reconstruction the main factor was how aggressive/conservative the surgeon was). This is important to help you choose what you feel is the best option for your case. Another thing to keep in mind when evaluating treatments is that doctors generally do what they're trained to do. Surgeons will look at the knee and tend to recommend surgery. Non-surgical orthopaedists (such doctors exist!) will tend to recommend against surgery. Do physical therapy. This is extremely important for your long term recovery. Your flexibility and strength need to be improved after these injuries. Start physical therapy as soon as possible after the injuries and surgeries, and be as aggressive as possible. You can shop around for physical therapists, too. I recommend one who doesn't have any mercy. Nothing: It happens, some people do nothing. There are also varying degrees of foot-drop; doctors use a dorsiflexion scale of 0 (no dorsiflexion at all) to 5 (normal). At a level 3, you technically have some foot drop but may not need help to raise your foot. The danger with not doing anything about your drop foot is that you are at a much greater risk of breaking your ankle or twisting your knee when you trip over your toes. You have to develop a special walking technique wherein you lift your hip and knee more to compensate for being unable to lift your foot. Wear an AFO: This is the most common solution. I wear an AFO. AFO stands for Ankle-Foot-Orthosis. An orthosis is a device to help stabilize a joint. 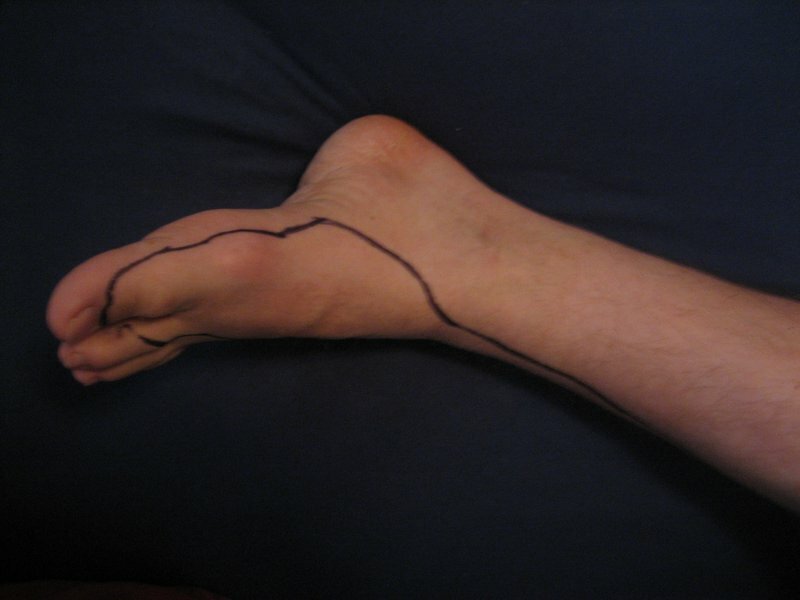 The AFO is (usually) an L-shaped piece of plastic which runs along the sole of your foot and wraps up the back of your leg, usually to about mid-calf. You can buy generic over-the-counter AFOs, or get custom-fitted AFOs. Here's an decent introductory article about AFOs. An orthotist is the professional who will fit you with an AFO. They are not "real" doctors, so you will need a prescription for an AFO from your PCP or your surgeon to take to the orthotist. They will take a quick cast of your foot and week later will have the AFO ready. The custom AFOs are generally sturdier, safer, and can be whittled/modified for more comfort if needed. A generic AFO costs around $30, and a custom AFO can cost anywhere between $300 and $1000. Check your health insurance to see if AFOs are covered under your plan. Be careful here, you may want to reference the specific AFO billing codes (ask the orthotist what they are); most plans don't cover foot orthotics and most health insurance people answering phones will just assume that an AFO (which most people haven't heard of) is the same thing as a foot orthotic. I'll list some of the bigger companies that make AFOs, but there are probably more out there: CAMP (a Scandinavian company), Orthomerica, ProCare (more of a prosthetics company but they have some orthotics), and Seattle Systems. There are two big distributors of orthotics that most orthotists use: SPS and Cascade. You may also want to check some of the the physical therapy distributors like North Coast Medical for some of the cheaper generic AFOs. Once you have an AFO you're happy with, I recommend finding a shoe store that caters to people with walking problems. In the bay area, try Walk-Rite Foot Solution stores (one at Town & Country in Palo Alto and one at Westgate mall in Saratoga). I think this is a chain, so check your local metro area for these stores too. They will be able to sell you better-fitting shoes (now that your shoe needs to accommodate your foot and a brace), stretch shoes if needed, and retrofit them with gadgets like leather tips so that they don't catch on the ground so easily. If the size disparity between left and right is too large and you don't want to buy two different pairs of shoes in 2 sizes, you may want to try a shopping trip to Nordstrom's: they will sell you different-sized pairs of shoes. You may also want to try "strap" solutions. Instead of using a brace to hold your foot up, you can use a tie to pull your foot up. There's a company online at x-strap.com; I bought one and am still evaluating it. It definitely is far more comfortable for your foot, but I'm having trouble keeping it on during more strenuous physical activity. If you're having comfort issues with an AFO, I definitely recommend trying this out. Thanks Linda for recommending this! Custom AFO here With my insurance, this cost around $150 and has been worth it. It was made from a mold of my foot, and I made some further changes with the orthotist (like the hole in the heel and the length of the ridge along the lateral side). Here's the shoe setup: I buy two pairs of New Balance 853 shoes, an E for the right (normal) foot, and a 6E for the left foot. I take the insole out of the left shoe. I insert the AFO. I insert a not-fancy orthotic insert for padding so that I don't walk on the plastic. I then put on the shoe and secure the AFO. This is expensive, I essentially buy two pairs of shoes each time, I'd love advice on how to get around this. Also, you can see in the last photo that my foot is not flat in the shoe, it rolls outwards a little bit (this is due to the mechanics of walking with foot drop wearing the outside of the sole faster than the inside). This is starting to bother me and become uncomfortable. If you have an idea how to counter this, I'd love to hear it. X-strap's Dorsi-lite here This is Mike from X-strap's latest addition. It looks similar to the A-Force night splint but less flimsy. I bought one and tried it for a few weeks but don't think I'll continue using it. The velcro is not generous and glue already started to become undone after only 4 uses. To get the amount of foot lift that I like I had to tie it rather tight which cut off circulation after a while. ASO ankle brace see website (this is found all over the web) This is basically a sports ankle brace. When I get sick of the AFO, I usually wear this with a regular left shoe. It doesn't provide as good a foot lift as the AFO, but it is much more comfortable. I sometimes wear it for a day of walking, it's much more forgiving on the ankle in the case of a misstep. Dorsal Night Splint (this is found all over the web) here I can't recall what this splint is called. It's the best night splint I've tried so far. For some reason, I sleep better when my foot is in a night splint. It can often become uncomfortable though, and more than half the nights I end up ripping it off at around 4 AM. the X-strap none I tried this only twice a long time ago, and need to give it another shot. I can't remember what I thought of it, except it definitely added to the foot 'slapping'. It is super light, and I do bring it with me on travels just because it's a backup solution that takes up zero space. It can also combine really well with an ankle brace or other solutions, which I haven't tried doing yet. Plantar FXT by Thermoskin here Several people have mentioned this one to me, I suppose it's popular. It's intended to help with plantar fasciitis, but from the picture I thought maybe it could help with foot drop. I gave up after a few nights, even after some sewing modifications were made. It's not the most comfortable gadget and does an uneven pulling job, not staying attached very well. Swede-O's Step-Smart foot drop brace none I just discovered this, I think it may be new in the last few months. I'd like to try it, unfortunately, the price is $350!! I will ask my orthotist if he can't get a cheaper price for it. Update: my orthotist got one for free on a trial basis, and he gave it to me to try out. So far, it's the best orthotic I've tried in terms of stabilizing my ankle and lifting my foot, but it's not the most comfortable gadget (my custom AFO is more comfortable). A tough call. the Easy-Gait brace none Thanks Jennifer for writing and suggesting this brace. I haven't tried it out at all. It looks really expensive - around $500. They do appear to have a foot-drop solution for sandals, which is nice. the Dyna Ankle brace none Thanks Jimmy for suggesting this. This looks like a standard thermoformed AFO with the addition of some straps. The straps will help with eversion, obversion, and ankle stability. I haven't tried this yet. Ossur braces see website Thanks Joe for suggesting these. ODFS dropped foot simulator see website Thanks Joe for suggesting this. I haven't investigated this - but it seems similar to a TENS unit. Anyone have experience? Ossur's foot-up brace Thanks Erin for suggesting this. Have "foot-firming" surgery: I don't know too much about this, since I haven't really considered it. Instead of an "external" foot-drop solution like an AFO, you can permanently alter your foot so that it doesn't drop. 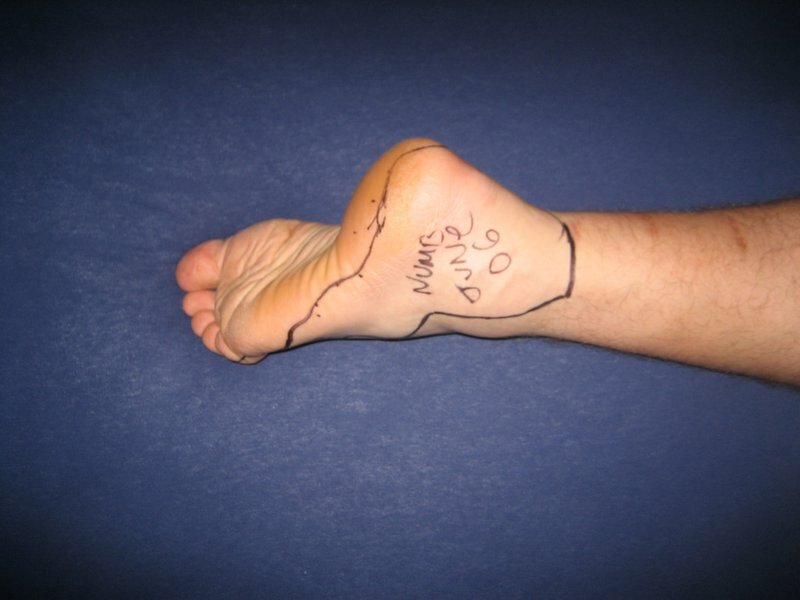 The two ways I've heard of are a tendon transfer (where they take part of the achilles tendon from the back of your ankle and move it to the front - so this tendon will keep your foot up) and a bone fusion (where they melt all your ankle bones together so that it can't bend). These aren't viable solutions until enough time (usually at least 3 years) has passed to rule out beyond a doubt that your nerve will regenerate or the nerve graft will or won't succeed. Proper care of your foot is important. I've heard a statistic that says 80% of foot amputations are as a result from an infected foot blister. Loss of feeling due to foot drop and wearing an AFO can lead to blisters - so lots of cleaning and striving for comfort is important. Another thing to be careful about if you have numbness is sunburns - you can't feel them! Enough people have written me to ask how I'm doing that I'll make it a permanent section of the website. I'm doing fantastic. I feel no pain. My surgeon did a great job repairing my knee, and I did an OK job with the rehab, so the knee is not a problem with my lifestyle. The foot drop is more limiting. My athletic activities are restricted since I don't have precision foot control with my left foot (which I find is required for things like running). I am limited walking, hiking on well-defined trails, biking, rowing, and swimming. Two people have written me and said that they managed to return to playing football with foot drop; this is something I can't fathom. Within 10 months of the accident (so 6 months after the nerve graft), I was backpacking around Europe. Within a year of the accident (8 months after the nerve graft), I was hiking in Yosemite. I have a slight limp that goes unnoticed by casual passers-by. Since the accident I've gained 40 pounds that have proven difficult to shed. It doesn't affect my work, but I have a white collar job, with moderate box lifting at times. Of course the less time wearing shoes and socks the more comfy I am. I recommend changing socks at lunchtime. Not that I get around to doing that anyhow. I had surgery to stabilize my right shoulder (it too was dislocated in the accident, remember) in November 2005. This was a run of the mill operation and was a complete success. Where I'm numb on my left foot because of the peroneal nerve damage: here and here. Where I'm numb on my right foot because of the sural nerve graft: here and here. The scar on the lateral side of my left knee from knee reconstruction and nerve graft (you can sort of tell where the scar was extended for the later nerve graft surgery): scar. The funny-looking scars on the back of my right leg from the sural nerve harvest: here. I'm happy to answer your questions, go into more detail, or learn about your experiences and hear your recommendations. Thanks to everyone who has written me already! How did you get foot drop? What do you use (if anything) (or what surgery did you have) to counter the foot drop? I'd love to hear details if it's new to me (not on the list above). If you wear an AFO, what shoes do you wear? I'm always looking for help on comfortable shoe/sock/brace combinations. Does the outside sole of your drop foot shoe wear out fast, leaving your ankle to buckle out when you walk in it? Have you found a way to counter this? What do you do for your foot when you sleep? Do you wear a night splint? Where are you numb, compared to my feet? Different severities of nerve injury apparently yield different numb areas. Do you know how to say 'foot drop' in any other languages?